First of all, my husband and I got lots done this weekend in preparation for the baby - her room is almost completely ready now and all her clothes are washed (some of which may actually be too small when she comes out, the way it's going). So we're starting to feel quite ready. Today was another fetal assessment. My obstetrician assumed they would do an amniocentesis at this one, but they didn't. They said that there was virtually no way the baby's lungs would be ready already - particuarly because often babies of diabetic mothers do take a little longer to mature - so there was no point in doing an amnio yet. Instead, we have one scheduled for Friday morning, at which point the baby will be 36 weeks. So no baby this week (barring the unforeseen), but perhaps next week. 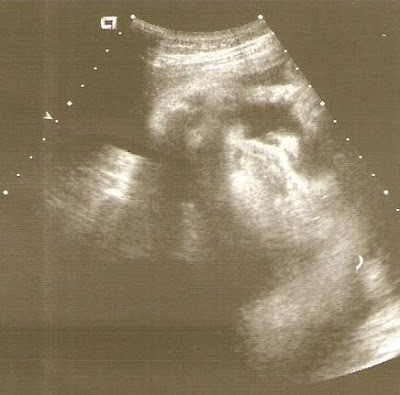 The doctor at fetal assessment was actually quite happy with the results of the fetal assessment. They baby's still big (almost 8 lbs now), but she's steady at the 90th percentile - not still rising, so that's good. Everything else about her looks great - heart, lungs, liver, kidneys, brain, etc. She's not showing any signs of problems. In fact, her responsiveness to touch (she kicked the ultrasound machine numerous times), and the practice-breathing she's doing are very good signs of both physical and mental developement, so that's good to hear. We even saw her make sucking motions with her mouth! So there's definitely no cause for immediate concern, but we/they definitely want to keep an eye on her. The resident doctor doing the fetal assessment said that the baby had moved since last week. She's still breech and her head is still in the same place, but instead of having her back along my right side, her back is now along my ribs and left side. How she has room to move around in there, I have no idea! That said, she also mentioned that I have a LOT of amniotic fluid in there, which is part of why I have gotten so big and uncomfortable, and also part of why I'm having so much swelling in my legs/feet - I guess my heavy belly puts a lot of pressure on the veins in my hips and doesn't let things flow around between my legs and my body the way they're supposed to, so it all gets stopped up in my legs. Fun fun. So, for now we're still in this "wait-and-see" mode. I'll post an update after Friday's amnio. Here are two pictures from today's F.A. They're both a nose & lips shot. 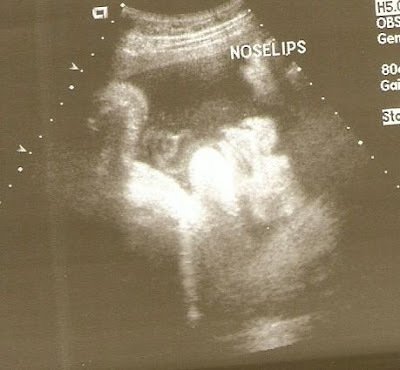 Look at those lips!